Bangka Island, the Beach Paradise! I suddenly remember a journey our family took, over ten years ago to Bangka Island. We stayed at a beach resort, which was amazingly close to the white sand. I was with my siblings, only around 10 years-old, but I can remember vividly the striking green water, in contrast with the tremendously beautiful azure blue sky and perfect white sand. The water was fresh and the wind was cool, even at day time. To my surprise the beach was very very extra clean, unlike many other beaches in Indonesia. Moreover the food at the local food stall are mostly good and cheap in comparison to Jakarta's price. Tanjung Pinang is the second largest city in the province of Riau after Batam, in the form of a tourist island in Indonesia with a distinctive touch of Malay culture. 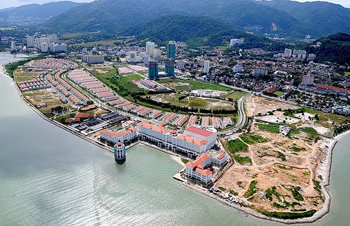 Tourists visiting the Tanjung Pinang can find almost all kinds of tourist attractions, enjoy a delicious culinary bark, tracing the history of the Malay kingdom, explore the edge of the beautiful beaches, to travel shopping branded items at affordable prices.